We thought we had come upon just another photograph of a work party after the April 18, 1906 earthquake. Here was a large group of men wielding tools in a rubble-strewn street. But something wasn’t right. These men looked a little too well dressed for workingmen: nice hats and ties, watch chains, clean shoes. The scene is Front Street near California Street, with the offices of Ehrman Bros & Co. in the background. Did the cigar-importing firm put its employees to work as general laborers? The New York Times recently published a piece on the dirtiest block of San Francisco (Thank you for that, NYT. There doesn’t happen to be a soiled corner in New York City to write about?) Meanwhile, our new mayor is demonstrating her focus on clean streets by carrying a broom to public events. 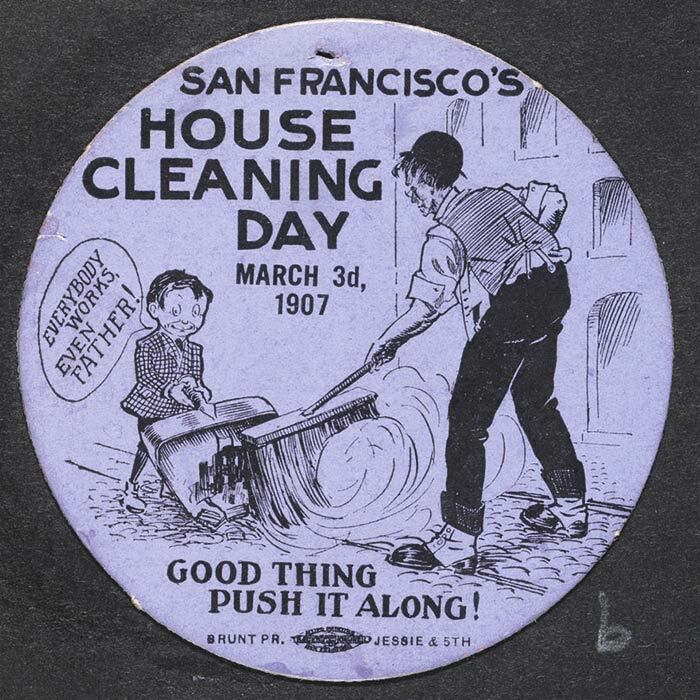 Should House Cleaning Day make a comeback? Could the city come together without the help of an earthquake? 1. “Propose City House Cleaning,” San Francisco Chronicle, February 12, 1907, pg. 7. 2. “Everybody Willing to Aid in Cleaning City,” San Francisco Chronicle, February 16, 1907, pg. 5. “Suggest That Saloons Close,” San Francisco Chronicle, February 20, 1907, pg. 3. 3. “Organize for House Cleaning,” San Francisco Chronicle, February 18, 1907, pg. 2. 4. “Protests Against Work on Sunday,” San Francisco Chronicle, February 18, 1907, pg. 2.; “Teamsters Offer Services in Cause of Clean City,” San Francisco Call, February 19, 1907, pg. 16; “Try to Discourage Zeal of Street Brigade,” San Francisco Chronicle, March 4, 1907, pg. 2.